FRANKFORT – In ways large and small, illegal drug use touches all of us. It steals the future of those addicted, it tears at the lives of their loved ones, it fills our prisons beyond capacity, it strains local and state government budgets, it overwhelms first responders and substance-abuse treatment programs and it keeps businesses from finding the workers they need. Drug addiction has been with us for centuries, but the crisis in Kentucky seemed to cross a threshold around 2000. In the years since then, our communities have been flooded with deadly waves of painkillers, synthetic drugs, methamphetamines and heroin. In each case, the General Assembly came up with money and legislation designed to stop it, and while that collective effort has been highly effective, the battlefield unfortunately keeps changing. On Wednesday last week, many of my House colleagues and I joined with Attorney General Andy Beshear to promote legislation that would give us another important tool in that fight. 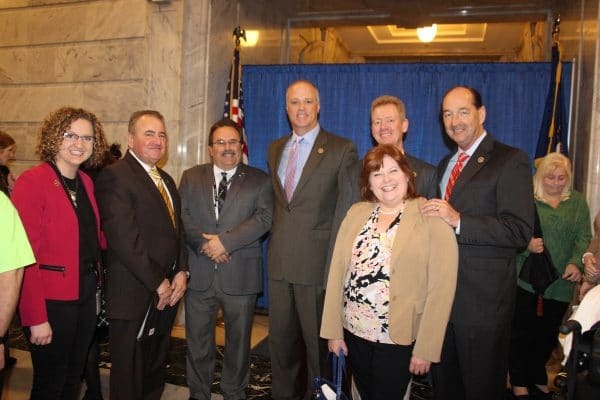 House Bill 219 would create the Kentucky Addiction Prevention, Enforcement and Recovery Fund and a new oversight committee to administer it. Its primary source of money would come from settlements won by the Attorney General’s office against irresponsible drug companies, manufacturers and distributors. As it now stands, these settlements may sit idle for as long as two years, until they can be budgeted by the General Assembly. That can be an eternity for many needing treatment now, so this approach would put that money to use almost immediately and benefit law enforcement, treatment providers and prevention experts. The settlements are often significant. They’ve totaled more than $40 million since 2014 alone, according to Attorney General Beshear, and he has several cases making their way through the legal system now, including one filed on Monday last week. That one says the pharmaceutical company provided more than 18 million doses of oxycodone and generic hydrocodone in Floyd County alone between 2010 and 2016. That’s almost 500 doses for every one of its 38,000-plus citizens, and in Perry, Clay, Owsley and Bell counties, the per-person prescription rate was more than 350. Again, this was just from a single pharmaceutical company, so overall numbers are almost certainly greater. It can be easy to get lost in a sea of statistics, but that fact – and another showing that four Kentuckians die on average each day from an overdose – underscore the true size of this epidemic and the need to do even more than we already are. As House Bill 219 starts its journey through the legislative process, another cleared its final hurdle on Wednesday last week, when the House approved Senate Bill 3. It still has one more step before becoming law, however, with voters deciding the fate of this proposed constitutional amendment in November. This legislation is more widely known as “Marsy’s Law,” and many other states have already adopted it to give more legal rights to crime victims. It’s named after a Marsalee (Marsy) Nicholas, a California college student who was murdered in 1983. Just a week after her death, her brother and mother met the accused murderer in a grocery store, unaware that he had been released on bail. That spurred Marsy’s family to action. Those in favor of this amendment argue that victims deserve to be better heard and informed during legal proceedings, while opponents argue that this approach has not always worked as intended in states where it is law and that it has been an unfunded mandate on already-squeezed judicial budgets. It is worth noting that Kentucky was the first state to notify victims of violent crimes if an offender has been released from jail or, if a protective order is involved, whether the offender purchased a firearm. As we all know by now, Tuesday was a tragic day for Marshall County and, really, our entire country, as we mourned the loss of two young students during a shooting at their high school. More than a dozen others were wounded. In the General Assembly, we often find ourselves differing over political matters, but we were united that day as Kentuckians while we paused and reflected on what had occurred. While we still do not know all of the details, we know that we must re-commit ourselves to making our schools as safe as possible. It is a goal that will undoubtedly be discussed even more as the legislative session continues. This week marks the one-third point of the session, leaving us with about two months to approve new laws and a two-year budget to run state government. Hundreds of you have already contacted me, and my hope is that thousands of others will join them in the days ahead. The General Assembly’s website – www.lrc.ky.gov – also has information about the legislative session, including the texts of bills and resolutions.